Blog reader Jeff Jordan asked: "I was wondering if you're using gouache strictly as a sketching medium, or if you've done or are doing finished works, illustrations, whatever, in gouache?" Jeff, here's an example that I did as a portfolio piece more than 30 years ago. I imagined these "Skysweepers" as flying vehicles that scour the grime off the clear dome that covers a city. The logo on the vehicle shows that the SOLAR corporation owns the municipal contract. But the fleet is dented and rusty, with black tape holding on one of the headlights. The shop is a mess of leaking oil. Mechanics are drinking on the job, and they've brought their dogs to work. 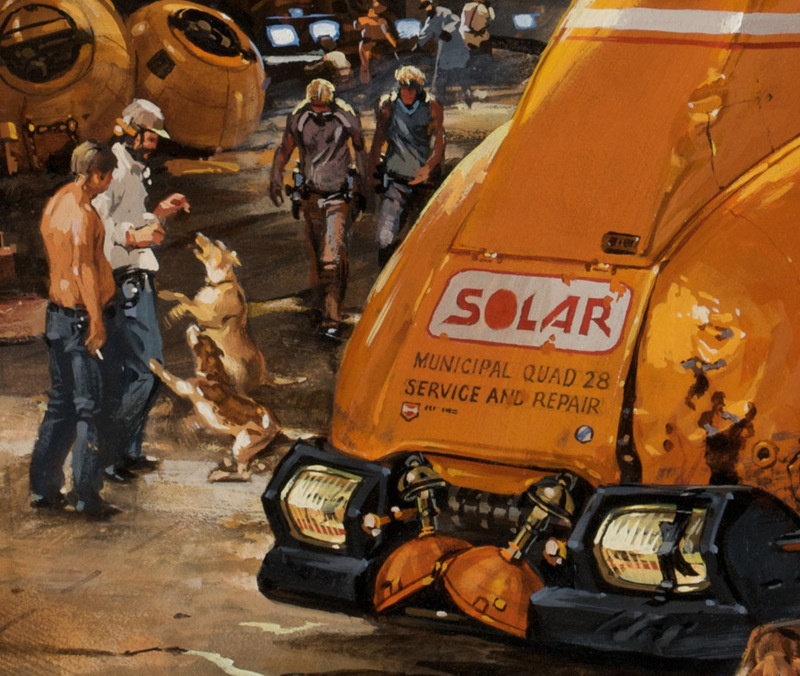 The idea of creating a future with an embedded history came from Blade Runner and Star Wars. I was also inspired by the gouache production designs for those movies by Syd Mead and Ralph McQuarrie. For this painting I combined some acrylic with the gouache, especially in the smoky areas. I still like using gouache for vehicles, robots, and architecture. 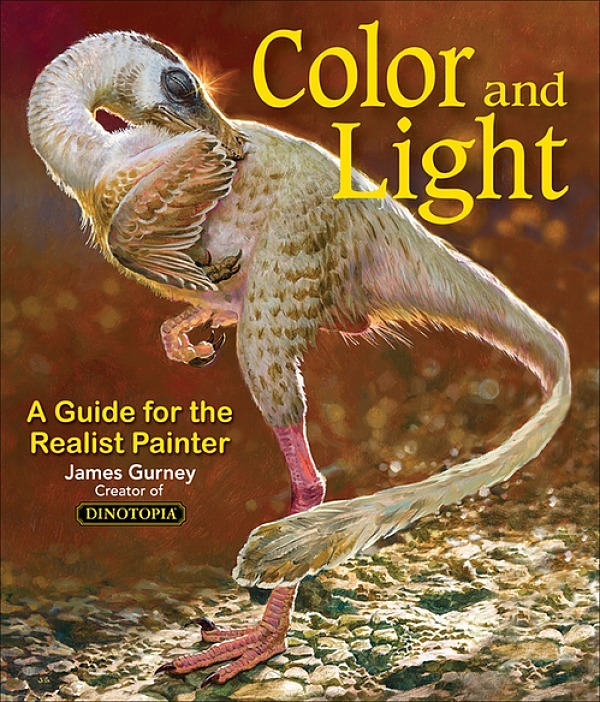 I did some sepia paintings, such as "The Sinking of the Hagfish" and "Grapple Hold," in gouache for the recent edition of Dinotopia: First Flight (signed copies on our web store, also available from Amazon) . Skysweepers is reproduced in my book Imaginative Realism: How to Paint What Doesn't Exist which you can also get from Amazon. I'll do a post tomorrow with more ideas about designing a future with a rich past. Jim, I've loved this image from the first time I saw it. 30 years later and it still rings true and feels like an adventure waiting to happen! Would you mind elaborating on why exactly you "combined some acrylic with the gouache, especially in the smoky areas"? What effect were you trying to achieve? And was the combination of acrylic and gouache effective in achieving it? Thank you as always. a LOT is possible in goauche if you have the skill :). However,i wonder how the orangish-yellowish highlights in the second picture are so opaque that they cover the greyish underlayer of the parts in shadw on the vehicle. I assume you work dark to light and thin to thick like in oils here and that you do not "tile"? Hi Jim, I've loved this one from first view. Better than a thousand word answer, absolutely. When you first wrote back about the Sea Monster being gouache, I remembered that one instantly, I LOVE how that thing's moving really fast. Your gouache work in particular has been very inspirational. Hope you do a lot more! I admit I'd have never thought something like this could be achieved with gouache. I'd even more happy to know it since I just bought my first tubes after getting gouache in the wild. A question: did you use maquettes here too, to get the correct lighting, much like you did for Dinotopia? I agree with Jeff Jordan. This excellent painting is worth a thousand words - in several ways. It's a lesson in story telling, painting, and picture construction all wrapped up in one neat package. Oh, and also it's a great lesson in perspective! 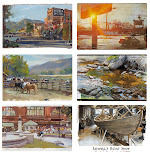 I thought I read somewhere that Alex Ross works, or did work, in gouache - - many of his paintings are quite elaborate. This is really nice work. It seems quite unlike what you presently do. Is there any reason that you do not work in this style? If that is accurate, of course. Amazing painting and one hellava portfolio piece! I can't imagine what it must feel to look at a piece from 30 years ago... Mostly because I'm not yet 30. How do you feel about it, Mr. Gurney? It looks phenomenal to me, but our harshest critic is ourselves. Is there anything about it that you dislike or would do better/differently? I love this painting so so much... first saw it in your book. I too am interested in your acrylic + gouache technique for smoke as another reader already asked in the comments! How did you apply them in those areas? Watered down like watercolors or like dry brushing? Did you do many layers to get that smokyness?